Chez Madame Mézino offers 3 fully equipped independent furnished lodgings, situated in a pleasant environment with an enclosed garden. One of them, adjoining the owner's house, accommodates 6 people comfortably, with 3 bedrooms, 2 shower rooms and a vast living room-kitchen with a terrace. 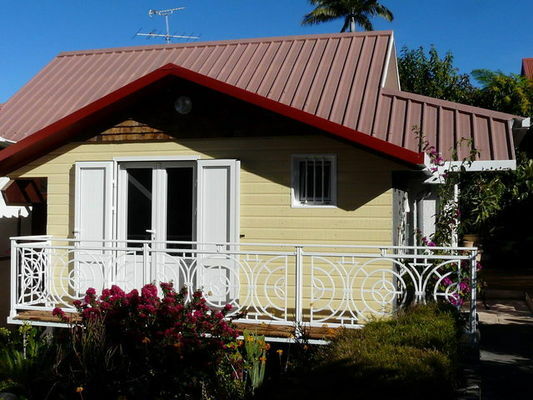 The other - a charming adjoining Creole case (cottage) - sleeps 2 people. Mrs Mézino also offers an adjoining gîte, equipped to accommodate 5 people with a double room and individual beds on the mezzanine. 2 km from the town centre, 10 km from the sea and the ""Hautes Plaines"" which are the starting points for hikes. Environment / Access : From Saint-Pierre, head towards Le Tampon. Stay on the RN 3 road and at the roundabout with the palm trees and the Catena hardware store, take the fourth turnoff on the right-hand side. Follow the arrows to 81t Rue Alexandre Fleming.